Craps is a game in which players wager on the outcome of the dice, which is the total of the two numbers on the face of the dice. The player can check his balance at the bottom left corner of the screen. The minimum bet is 1 unit and the maximum bet that can be placed is 500. 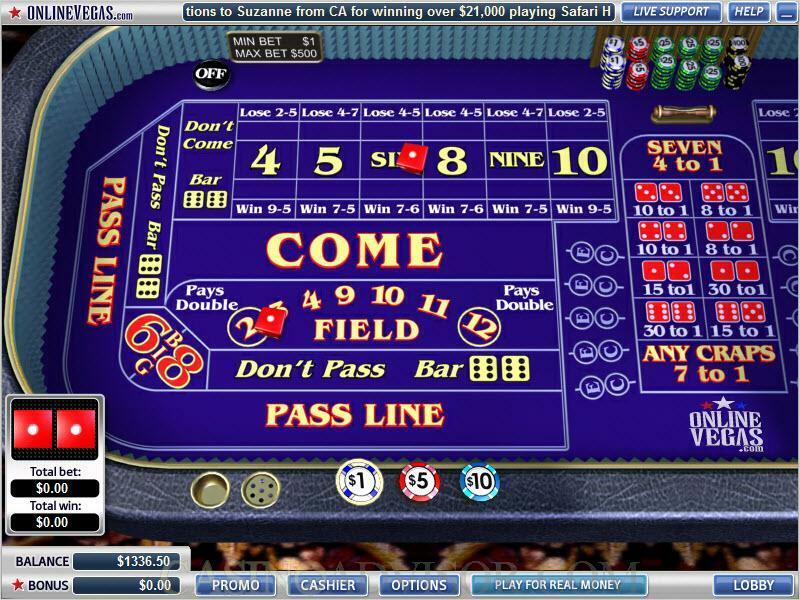 In order to place a wager the player first selects a chip by clicking on it and then clicks anywhere within the area designated for his bet. The chips are placed at the bottom center of the table. The player can add chips by repeating the procedure. Selected chips can be removed by right clicking on them. All the wagers can be removed by clicking on the ‘clear’ button. After placing the wager the player sets the dice rolling by clicking the ‘roll’ button. It may take a number of rolls to resolve the bet. Craps is played in rounds. Each round begins with a come out roll. Certain wagers are decided in the come out roll itself depending on the number rolled. In other cases the number rolled becomes a point and a marker is moved to that number on the craps layout. The point then figures prominently in many bets. Several of the bets such as Pass Line, Don’t Pass, Field, Place Win, Place Lose, Craps, Seven, Craps, Single Number Bets and Hard Ways Bets can be placed before a come out roll.. The Come, Don’t Come and Free Odds bets are placed after a point is established. The bets that are decided over multiple rolls are Place, Come and Pass. These are the more popular bets. Once a bet is decided the chips are automatically removed from the table so that there is no confusion. Vegas Technology Craps has excellent customization options. The best of these is the animation. With the animation enabled the player can see the dice are rolled across the table, hit the wall on the opposite end and come to rest. The player can at just the speed of the animation to his liking. In case the player does not want to see the animation he can disable it and in that event with the dice will instantly show the top faces. Players who want to complete more wagers in a given time usually disable the animation. The animation is accompanied by realistic game sounds that can be independently enabled or disabled. The game sounds include the sound of the dice being shaken, and the dice rolling across the table and hitting the wall. The game sounds also include musical flourishes that announce wins. The volume of the game sounds can also be adjusted. The background sound, which is background music, can be independently monitored. 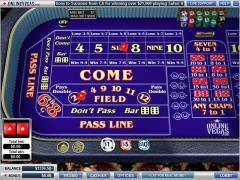 Interested in reading more detailed information about Vegas Technology Craps? If so Click Here for more details.